The NX300P NX Series Powered Loudspeaker from Yorkville Sound is a horn active loudspeaker which incorporates a 15" and a 1" driver within an injection molded polypropylene cabinet. The bi-amped 600W (peak) power module has efficient, easy to use controls. 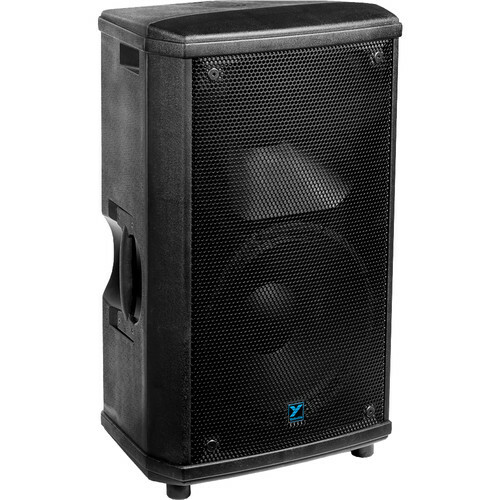 The speaker is equipped with an effective high, low EQ, XLR balanced microphone input as well as an XLR / TRS 1/4" balanced combi-jack line input allowing it to be easily connected to any source and quickly EQ balanced for the room. An XLR balanced line output allows multiple NX300P's to be linked together for use in an array or for easy distribution around a large room when used as repeater cabinets. The NX300P enclosure, has been molded for maximum versatility. The trapezoid box is ideal for mounting in arrays, or for use as a monitor cabinet with well-protected inputs and controls. The NX300P can easily be used in any orientation, and close to walls, floors and in close arrays with multiple cabinets.